All agates pictured are or were in the Spomer collection unless otherwise noted. Many of these were later sold to Wayne Shortridge. All those personally collected are still in my collection. I am particularly fond of reds and pinks, so the collection is skewered a bit toward bright colors. 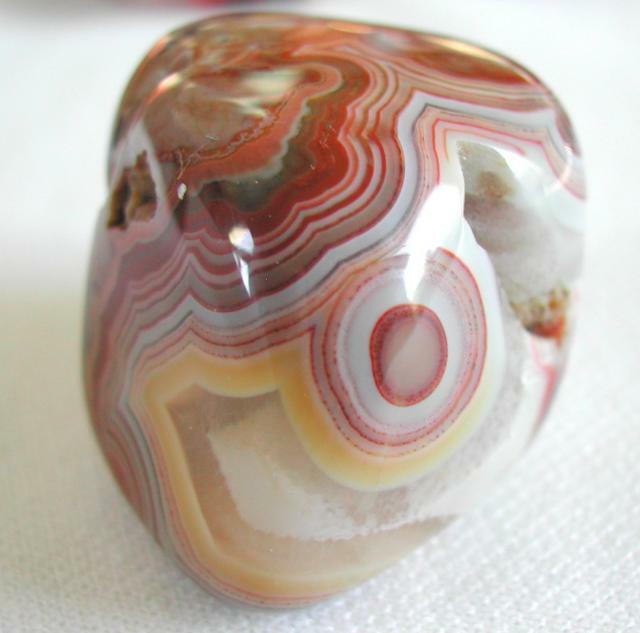 Many of my agates are polished as they are small. 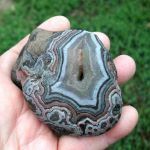 I feel each agate should be evaluated individually as to whether the appearance can be improved by sawing and polishing or just left natural. Not everyone can afford a world-class collection of unpolished, full-face Fairburns such as is owned by Tom Woodden, Roger Clark, Wayne Shortridge, and a number of others. 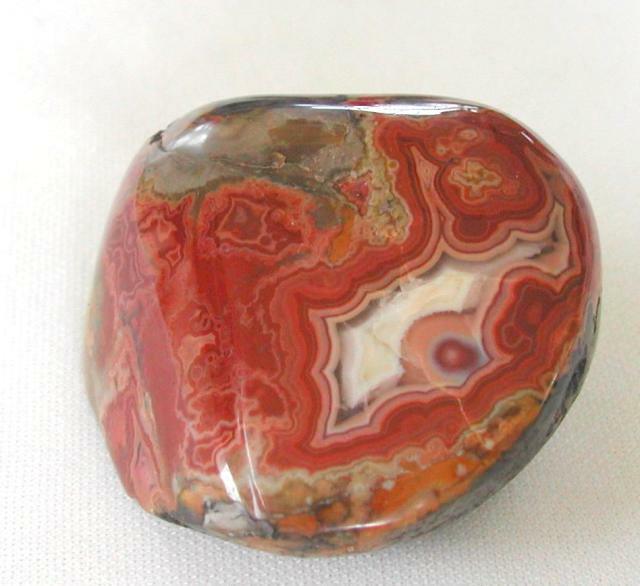 There are only so many of those types of agates, and the competition for them can be fierce. Found in Pasture 30 right after the Crawford Rock Swap in 2003. 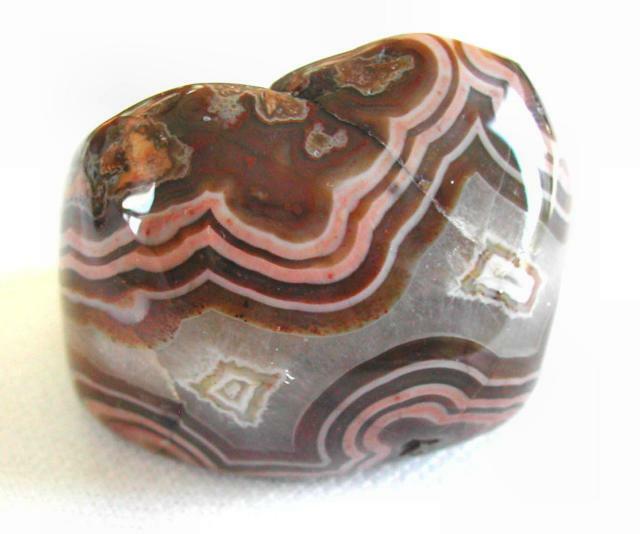 The heavy rains that were bad for the show were good for washing out new agate. 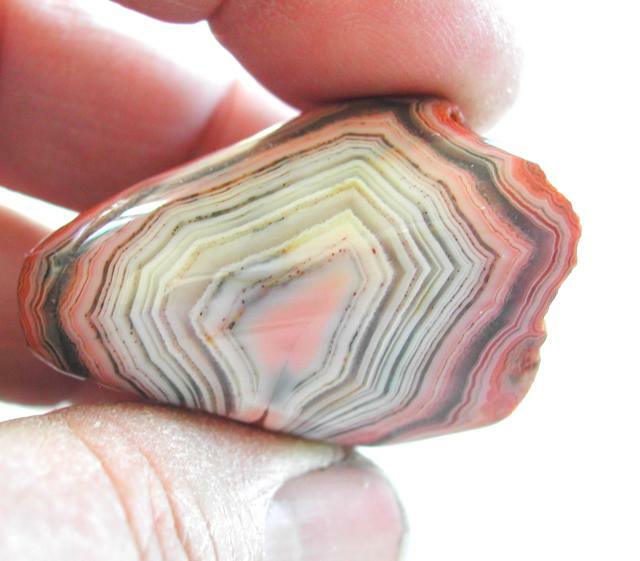 Probably the best quality agate that I've self-collected. Around 2". 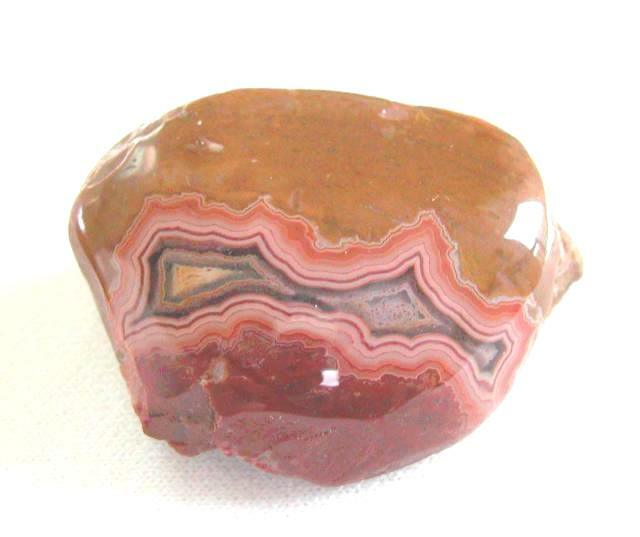 Here's a view of the other side of the agate. 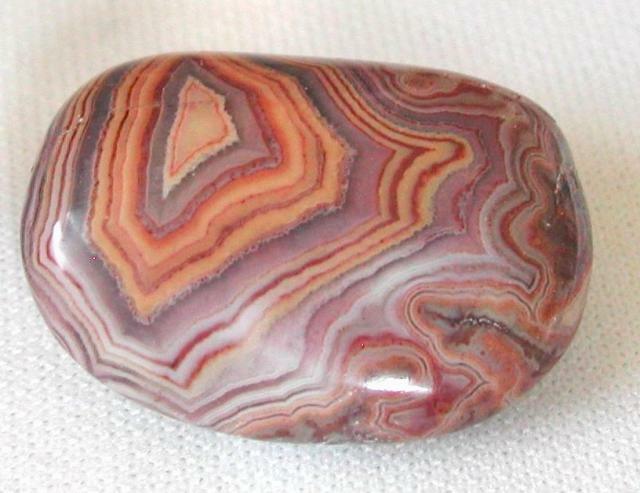 Unlike many Nebraska agates, there is very little matrix associated with it, and full-face pattern on both sides. This is how it was found, face up, at the bottom of a badlands blowout, with a bit of clay still stuck to it. I bought this one in Custer in 1997. It has unusual wide bands and great "eyes". This is the very first good Fairburn I owned. From Nebraska. I've had this one since the early 70's. Purchased from Irl Everett's Rock Shop in Lincoln. About 2". I found this one in May, 1997. From Orella, Nebraska, near Sugarloaf Hill. A little over one inch across. 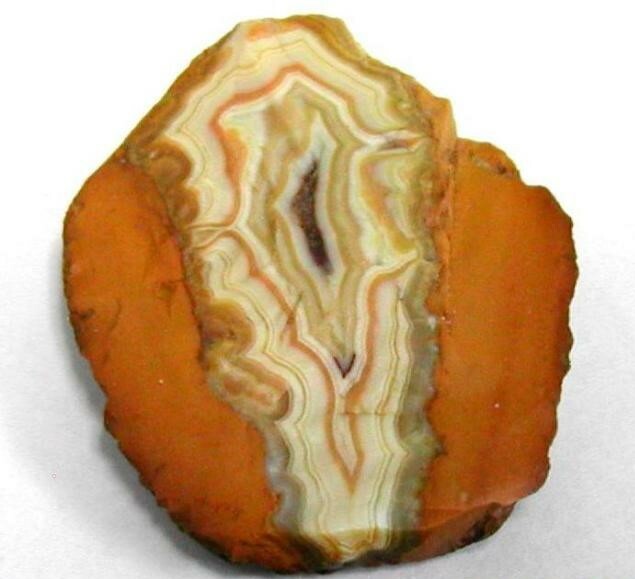 The colors are a bit similar to Tepee Canyon agate. 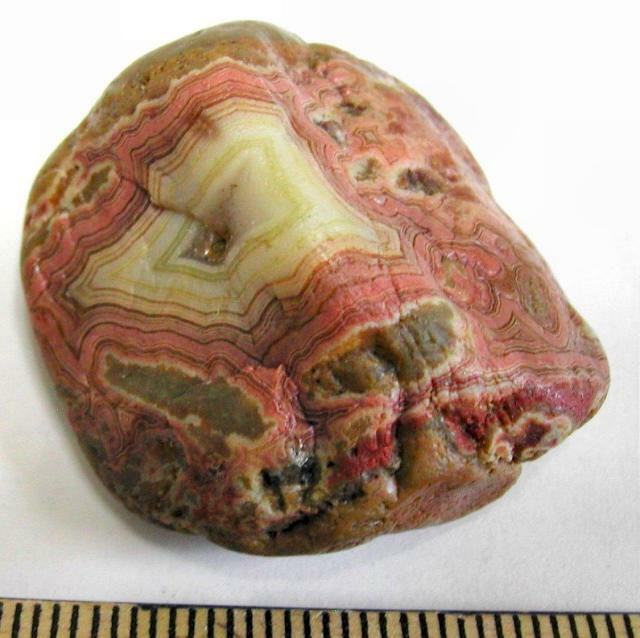 An agate from the old Ardmore, SD beds, just across the Nebraska state line. I don't believe these areas have been open to collecting for many years now. 3" long. My prized find from my trip in May, '97. 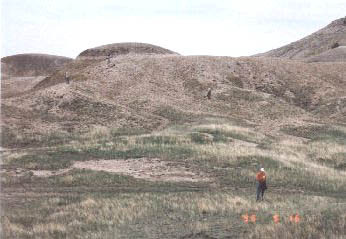 From pasture 27 north of Crawford, Nebraska. This one must remain unpolished. Looking closely, you can see that the black bands are really shallow oxidized bands of pink/red. 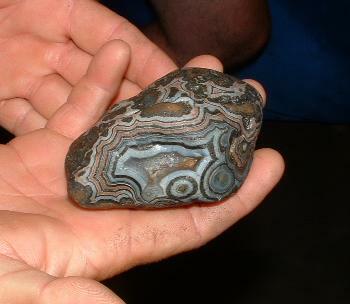 Here's a larger agate from the White River drainage north of Chadron, NE. Roughly 2-5/8". A nice small agate, likely from Wyoming. 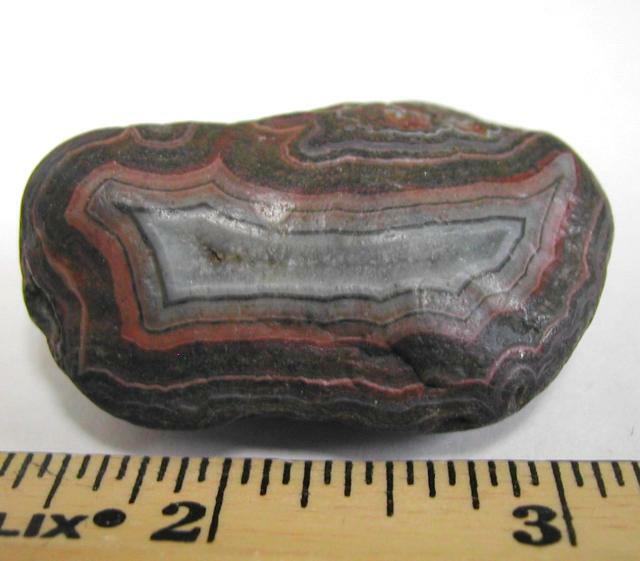 Another interesting small agate from the Wyoming beds. 1-1/2". 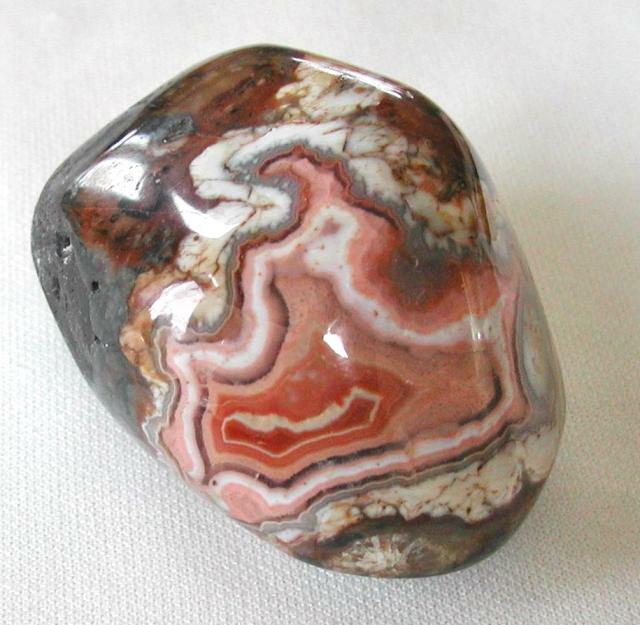 Here's a pretty pink, white, and brown agate. I'd guess it's from Railroad Buttes or that area of South Dakota. About 2-1/4"x2". A pretty pink and white agate from Wyoming. This is one where the pattern opened up considerably as I ground into it. Around 2-1/2". A bright red agate from Nebraska. This one has a crinoid stem piece on the backside. Since crinoids were only found during a couple of the past geological periods, it helps to pin down the when of Fairburn formation. Sometimes you find seashell imprints or fossils, and I've seen Fairburn pattern in fossil coral or other sea creatures. See Roger Clark's book for more details. About 2-1/2". A really pretty pink and black one from SD, possibly the Scenic area. This one just has the highlights polished, the rest is natural. Roughly 2-1/2". 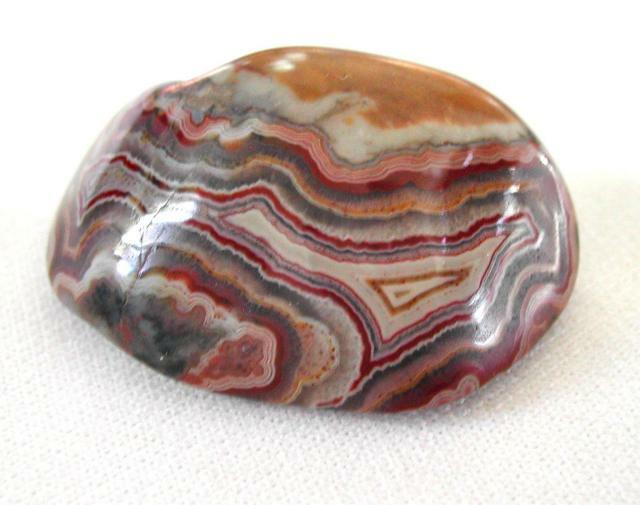 Now here's an agate! 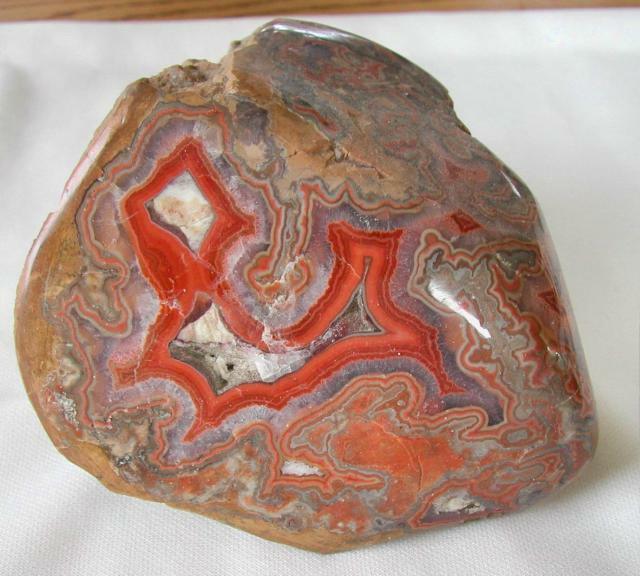 Randy Boyd found this incredible agate at Indian Creek, South Dakota and was showing it off at the Crawford Rock Swap in 2003. Yikes, I think that's one to retire on! Click here for a side view. 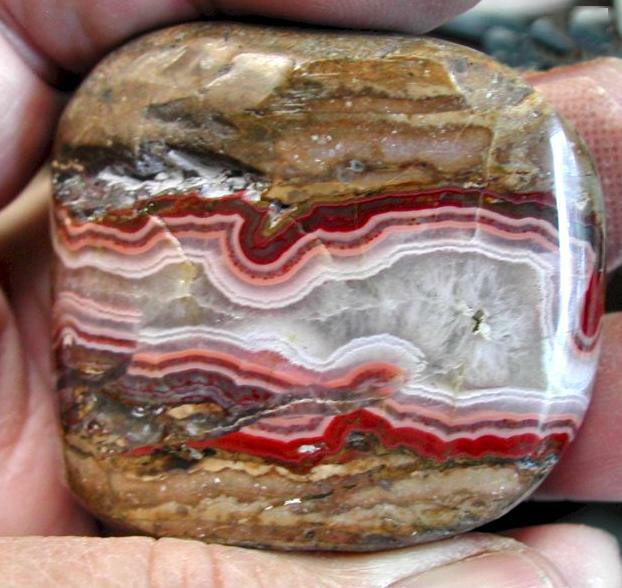 Here's a picture of the backside of Randy's agate, take by Dennis Buum, and used by permission. 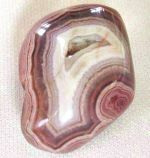 An unusual agate I won on eBay auction. Notice the broken and re-healed pattern. I'm not sure of the locality on this one. 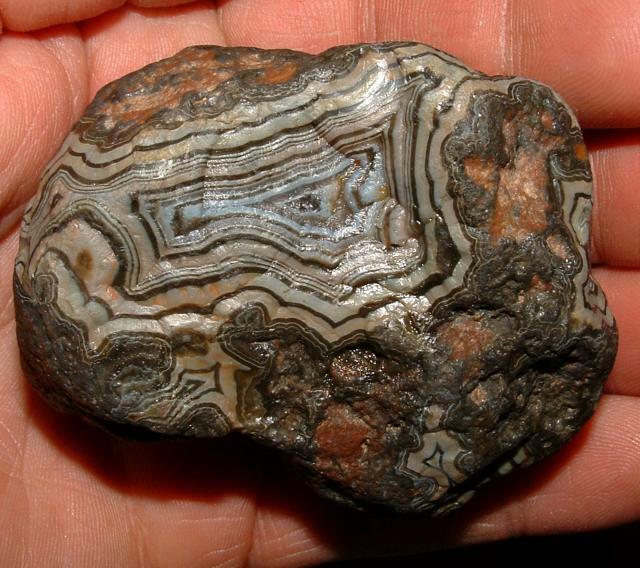 A real nice polished Fairburn from the Oelrichs, South Dakota area. Colors are a bit like Tepee Canyon. ~1-1/2". 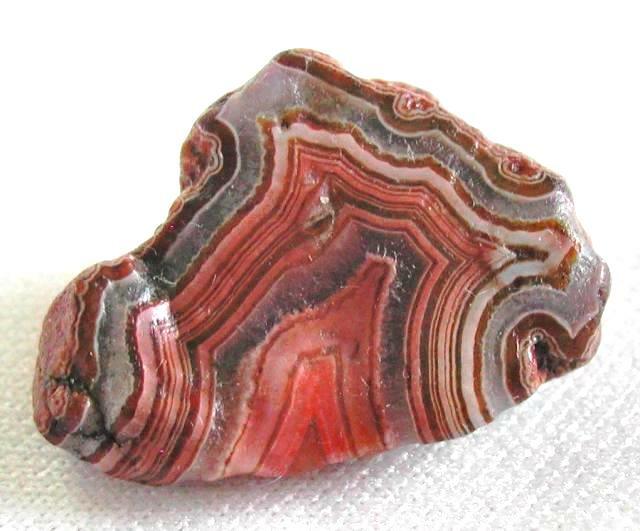 Great color in this small agate probably from South Dakota. You don't see black and gold banding together very often. About 1-3/4" long. 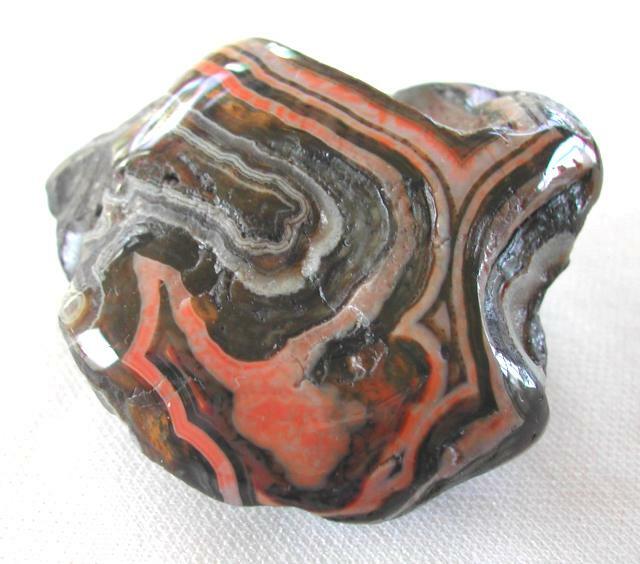 A darkly colored but attractive full-face pattern agate found on a private ranch near Hermosa, SD. 2"in length. 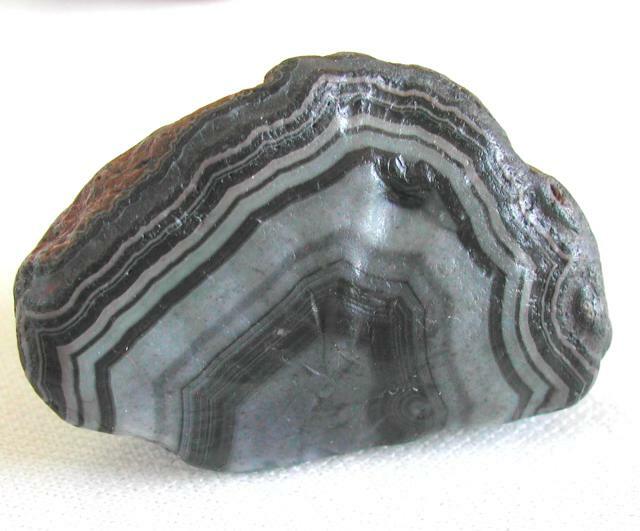 A fine black, gray and white agate. 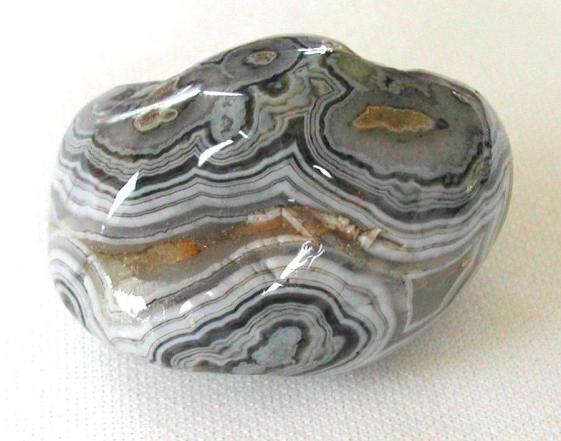 Black and white agates are actually some of the most rare. 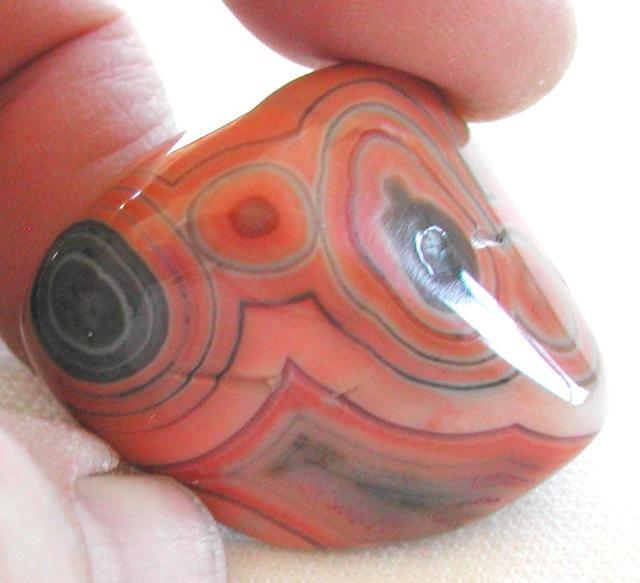 ~2-1/4"
Great banding in this Pine Ridge IR agate. 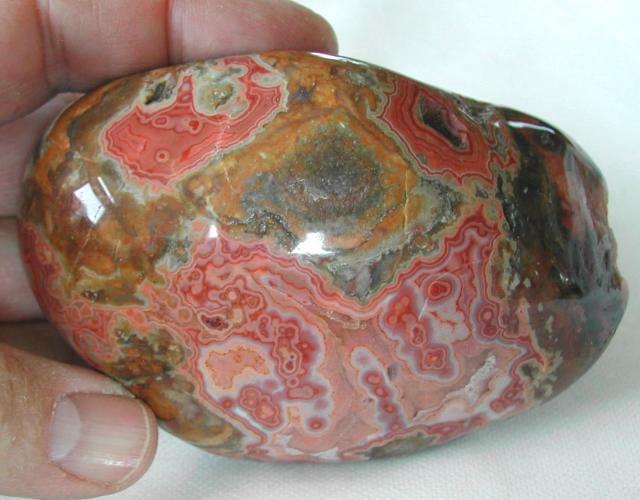 A nice red and white Kern type agate. 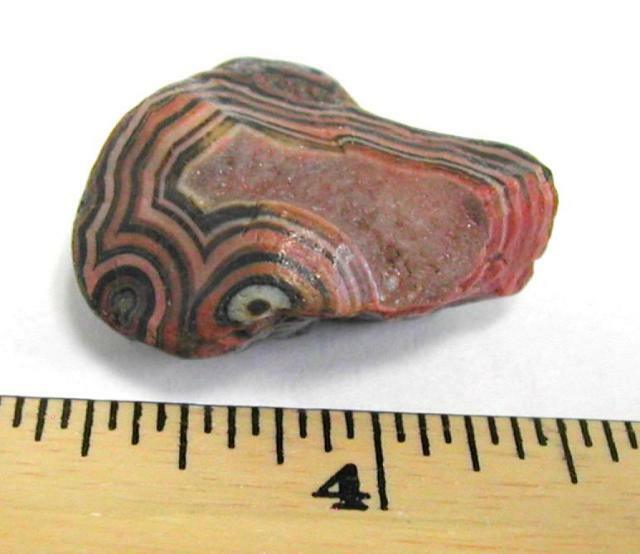 Great pink and red pattern from the Kern beds, South Dakota. 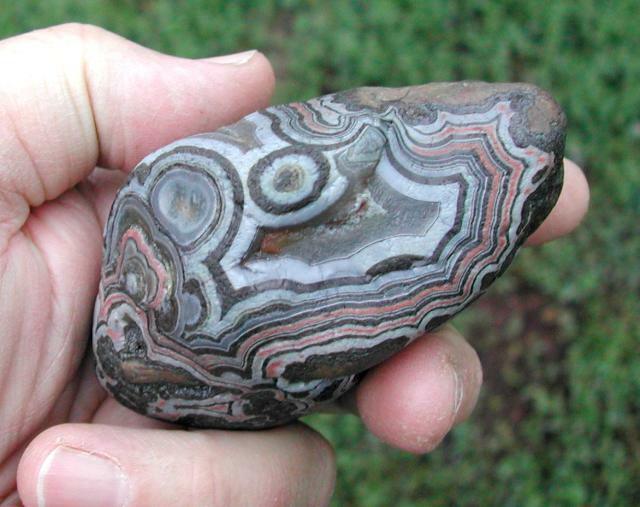 Nice little agate found in pasture 27 (NE) during the Crawford Agate Swap, 2003. ~1-1/2". An interesting flat one I found in pasture 27 (Crawford, NE) years ago, around 1990. ~2-3/8" long. 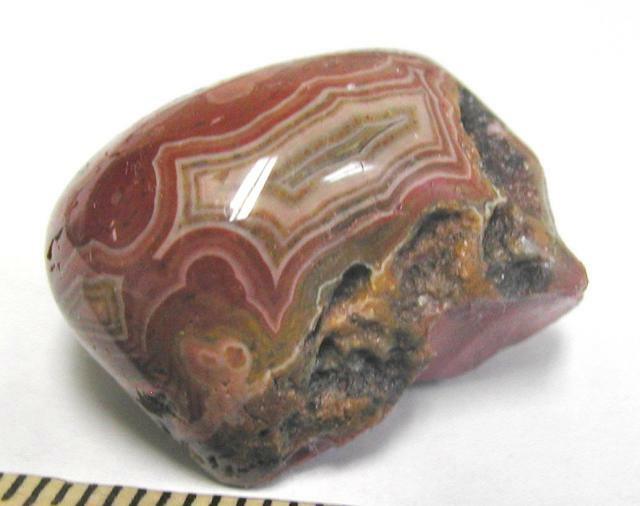 A really pretty agate from Pine Ridge IR, a bit less than 1-1/2". Here's a real nice "black and white" one from South Dakota. I believe this one to be from Pine Ridge IR. Unpolished. About 2" long. 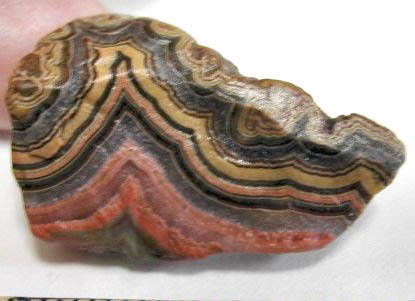 A typical Nebraska agate, I found in 2001 in pasture 30, north of Crawford. A bit less than 2". 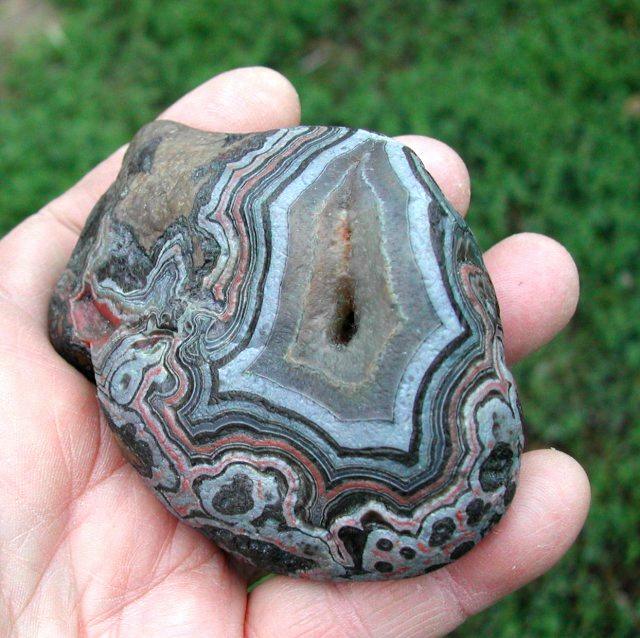 A super agate found by an anonymous landscaper recently at the gravel pit at Creston, SD. Photo by Dennis Bumm sent to me originally by Wayne Shortridge, and used with Dennis's permission. 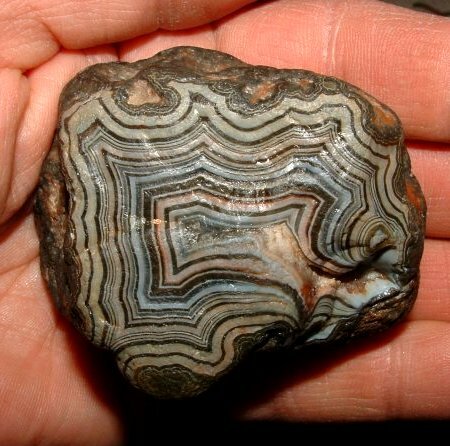 According to Dennis, the agate has never been offered for sale. 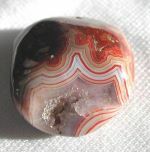 The backside of the above agate. Photo courtesy of Dennis Buum. 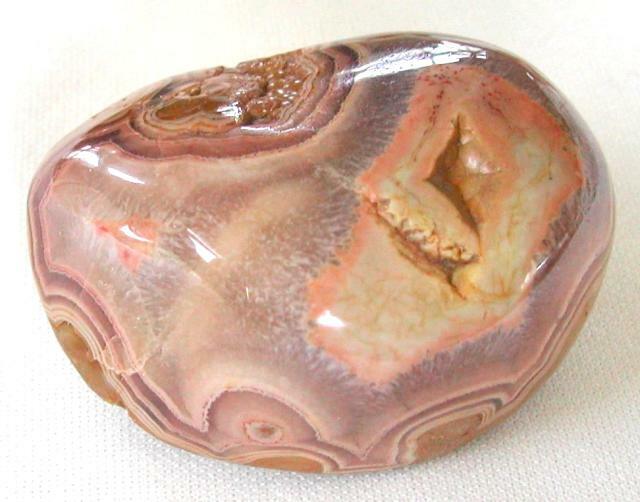 A beautiful large Hills agate found by Roger Clark recently in a forest burn area, and currently in his collection. Photo courtesy of Roger Clark. 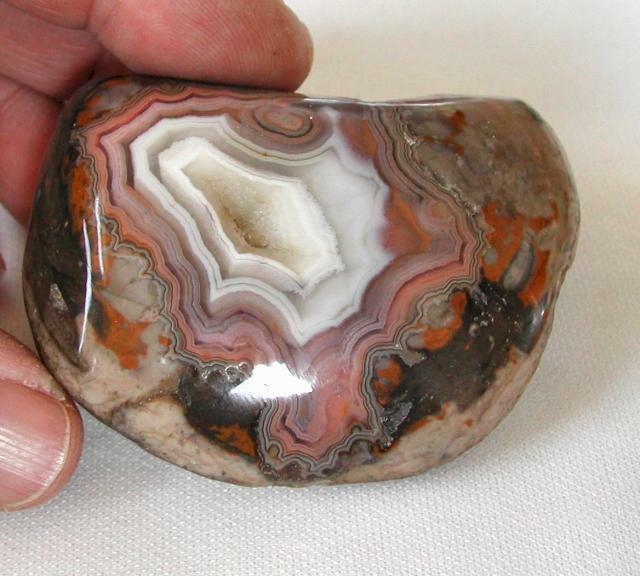 Large fist-sized agate. One band is faintly amethystine. Manville, Wyoming.